People’s willingness to use a Zika vaccine when it’s available will be influenced by how they weigh the risks associated with the disease and the vaccine, but also by their misconceptions about other vaccines, a new study has found. While a Zika vaccine is in development, the study by researchers at the Annenberg Public Policy Center (APPC) of the University of Pennsylvania examined factors that will affect the eventual acceptance or rejection of such a vaccine. The study, published in the Journal of Public Health, found that people’s erroneous beliefs about an association between the measles, mumps, and rubella (MMR) vaccine and autism were a predictor of people’s lessened intention to get a Zika vaccine. The study also found that people’s perceptions of the severity of the Zika virus as well as their general belief in the power of science to solve problems increased their intention to get the vaccine. 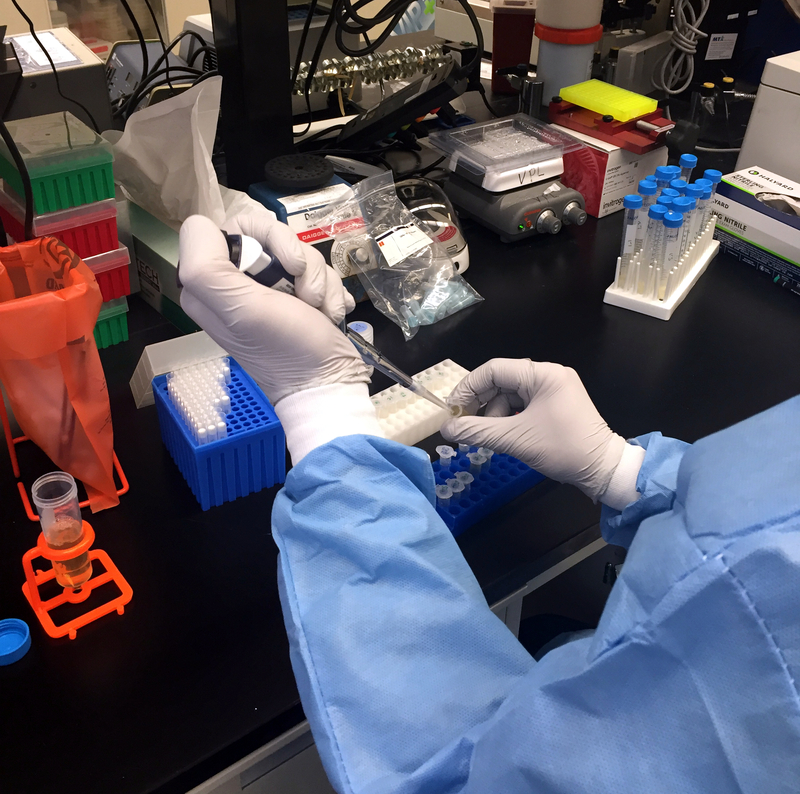 A Zika virus researcher at the NIAID Vaccine Research Center pipets samples. Credit: NIAID. The study analyzes 2016 data from APPC’s Annenberg Science Knowledge (ASK) survey gathered during the outbreak of the Zika virus, which is mosquito-borne and can be sexually transmitted. When a pregnant woman is infected, the virus can cause an increased risk of birth defects, including microcephaly. The study includes survey responses from 3,337 individuals between August 25, 2016 and September 26, 2016, which was part of a larger, 34-week survey of U.S. adults on attitudes, behavior, and understanding of the Zika virus. People who were engaged in behaviors to protect against Zika were less likely to intend to get the vaccination – which “may be the result of their confidence that their actions pre-empt the need to be vaccinated,” the researchers said. The bogus association between the MMR vaccine and autism has been disproven in numerous studies. However, the argument is still prominent among people who oppose vaccinations. “Scientists often look at the effect of misinformed beliefs about the MMR vaccine on people’s intention to vaccinate children with the triple vaccine, but they don’t as often look at the dangerous spillover effects that these misbeliefs can have,” said Ophir. He said that prior research has shown that it is very hard to completely debunk misinformation, such as the mistaken belief that the MMR vaccine causes autism, but the study results suggest that accurately communicating about the risks of Zika can help lessen the detrimental effects of the misbelief. “Even if we can’t change what people think about the MMR vaccine, if we can give them an accurate picture of how vulnerable they are to a disease such as Zika, they can make a more informed decision about it,” Ophir said. The study was funded by the Science of Science Communication endowment of the Annenberg Public Policy Center of the University of Pennsylvania. “Intentions to use a novel Zika vaccine: the effects of misbeliefs about the MMR vaccine and the perceptions about Zika” is published in the Journal of Public Health. To download this release click here.